Warzone has just been updated to version 4.15.0! This blog post describes what’s changed. The website has been updated to this version now. The Android app will receive this version in the coming days, and the iOS app will receive this version in the coming weeks. In Unity and UJS, links present in game chat or in the chat room will now be a hyperlink that you can click on to visit. This alleviates the need to copy/paste links into your browser to access them. This allows iOS/Android users to access features that were previously only accessible on the website, such as blog posts, map of the week, forums, the active twitch livestream, new maps, new community levels, and see ladder standings. 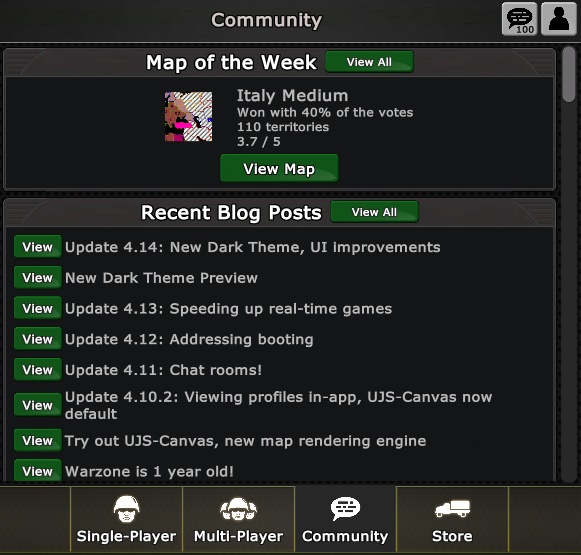 Map of the week also allows voting, as well as browsing previous map of the week winners. Forum integration allows browsing each forum, making new forum threads or replying to forum threads, as well as upvoting or downvoting forum threads or posts. The Development category shows your own mods while you’re working on them, and are only visible to you. The other three are publicly visible. The categories are determined by an admin based on the stability and general usefulness of the mod. New mods will start out in Experimental and then move up as they’re tested and proven to work well by the community. 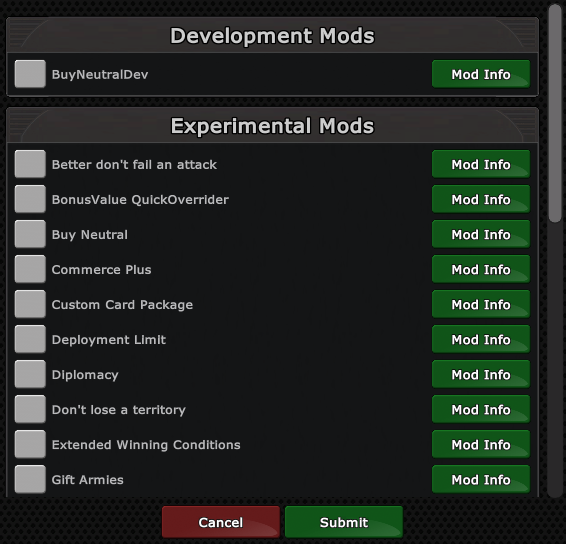 This helps new users of mods have a good experience with them by picking the mods that are known to work reliably. The maximum storage size available to mods has been increased from 100k to 1000k. This helps ensure that mods won’t die when used in very large games. In an update a few weeks ago, the performance of mods was greatly increased. Like the storage size increase, this helps ensure that when mods are used in very large games they don’t time out. Finally, mods now have a “trusted” flag that can be set by administrators. Only trusted mods can be submitted to quickmatch, and this flag will also be used in the future when ladders and tournaments support mods to ensure that malicious mod owners don’t try to sneak in changes. – Unity/UJS: Sped up the speed of the game chat panel opening. – Unity/UJS: Fixed the “chat chunk negative” error. Thanks to Bonsai for reporting this. – Unity: Links in private mail threads are now clickable. – Unity: Fixed display of large round robin team tournaments. Thanks to Min34 for reporting this. – Unity: Fixed color of icons on settings page. Thanks to Bane for reporting this. – Unity: The Contact Fizzer button now uses the built-in mail page instead of redirecting to the website. – UJS: Fixed errant “Friends” tab when changing players in a custom single player game. Thanks to Muli for reporting this. – UJS: Fixed multi-select checkbox not showing up until window was resized. Thanks to Muli for reporting this.